National Nurses United, which includes the Minnesota Nurses Association as a major affiliate, today called on Minnesota Governor Mark Dayton to appoint Rep. Keith Ellison to fill the U.S. Senate vacancy created by the resignation of Sen. Al Franken. 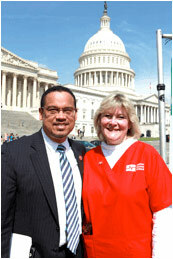 “Keith Ellison is an outstanding progressive champion will provide a critical voice of leadership in the Senate at this pivotal moment for working people in Minnesota and across the U.S.,” said NNU Co-President Jean Ross, RN, herself a Minnesota resident and longtime Minnesota RN. “At a time when the Senate is poised to enact a disgraceful tax bill that shifts more resources from working people to big corporations and the 1 percent, on top of repeated attacks on health coverage, environmental and workplace protections, and other critical fights, we need the proven progressive voice of Keith Ellison in the Senate,” said Ross. “Keith has been an outspoken advocate for nurses and other working people in his distinguished service in the House, and has shown a broad national reach and worked to build coalitions across the country this year as the Deputy Chair of the Democratic National Committee. He is exactly the representative we need in the Senate today,” said Ross. NNU has worked closely with Ellison on a broad range of issues, including his support for Medicare for all/single payer health reform, a direct contrast to the repeated efforts of Congress to roll back health coverage for tens of millions of people. Ellison is also the sponsor of a key bill in the House, HR 1464 that could raise hundreds of billions of dollars annually to fund critical social needs with a small tax on Wall Street speculation. “This small tax on Wall Street would go a long way to raising the revenue for our most vital needs, including living wage jobs, healthcare for all, student debt relief, and fighting climate change,” Ross noted earlier this year when the bill was re-introduced.